Deep Brain Stimulator is a battery-operated medical device called neurostimulator, used in neosurgical procedure which helps to treat a variety of disabling neurological symptoms. Globally, development of technologically advanced product including electric current fractionated implantable pulse generator (IPG), rise in the incidence of Parkinson’s disease, growing R&D pertaining to deep brain stimulators are the prime growth drivers of global deep brain stimulator market. In addition, increase in adoption of deep brain stimulator and emerging economies such as China, India and others, will create new opportunities for global deep brain stimulator market. However, higher cost of research and development, risk of allergic reaction to the DMS parts in case of DMS placement, increased risk of infection are the key restraints for global deep brain stimulator market. This report identifies the global deep brain stimulator market size in for the year 2014-2016, and forecast of the same for year 2021. 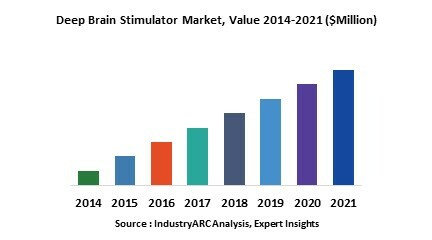 It also highlights the potential growth opportunities in the coming years, while also reviewing the market drivers, restraints, growth indicators, challenges, market dynamics, competitive landscape, and other key aspects with respect to global deep brain stimulator market. Geographically North America dominated global deep brain stimulator market due to reimbursement policies and sophisticated healthcare infrastructure. Asia Pacific is projected to have fastest growth, owing to rapidly increasing aging population, growing disposable income & healthcare expenditure, rise in awareness levels and modernizing healthcare infrastructure in developing nations such as China and India in this region. Among all the end-users, hospitals has the highest market share in global deep brain stimulator market.